ThruLines is fabulous but a little buggy. I was constantly getting page not found apparently due to a cookie problem and was wondering if I would ever finish this post! A trick suggested in Blaine’s DNA tools group on FaceBook solved this for me. I now open the ThruLines page as a private or incognito page by using the right click menu in Firefox or Chrome. 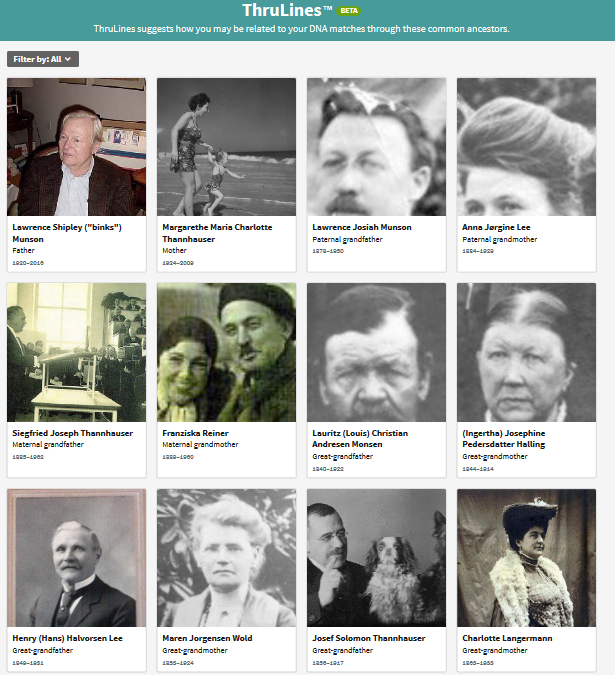 The ThruLines page shows images of each of your ancestors with whom you share DNA matches, ordered by most recent first. 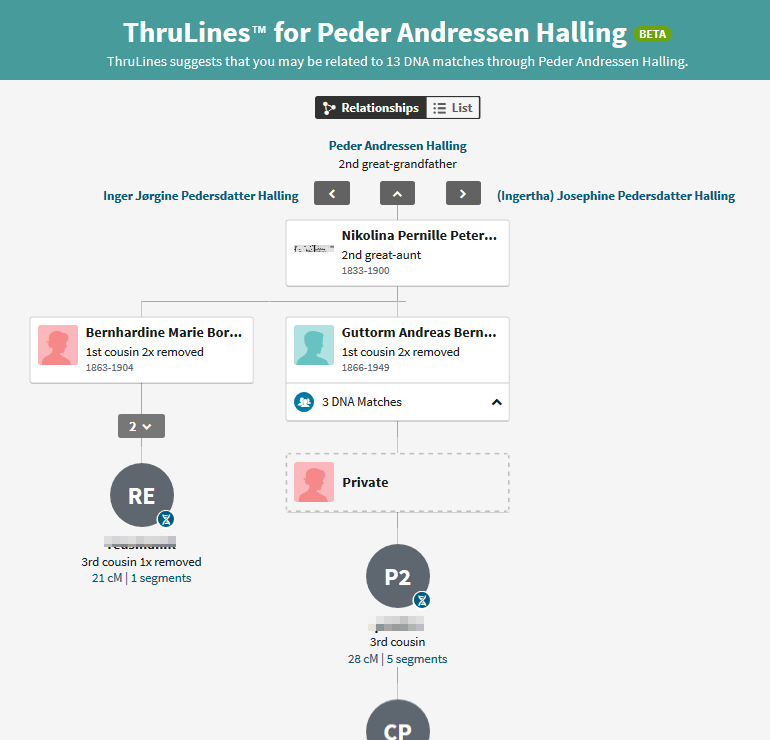 Since I have tested my brother and many first, second, and third cousins, there were no surprises in the first four lines (16 ancestors) but once I got back to my great great grandparents I found a number of new cousins that I had not found before on my Norwegian side: descendants of my Wold great grandparents and my Halling 3rd grandparents. One of the nice things is that Ancestry can see past the private parts of trees to find the connections. It shows you living people as boxes marked private but can still connect them back to the common ancestors. It also indicates whose tree the information came from, which is helpful when you know there is an error since you can click on the tree name to see it and contact that person to request that they fix it. 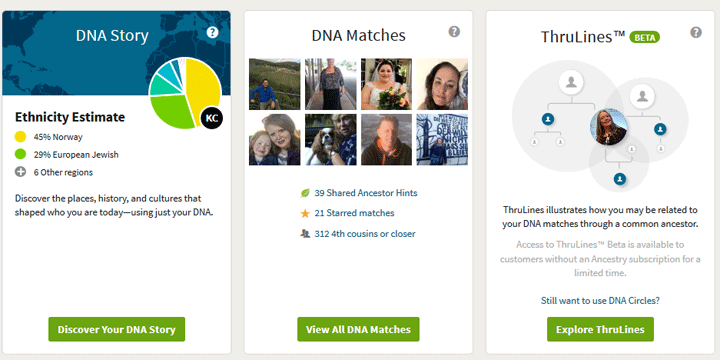 I was about to complain that I would prefer to see these ThruLines theories start from my DNA matches rather than my ancestors when I discovered that if I joined the Beta test of the new matches page they do exactly that, among many other wonderful new features. 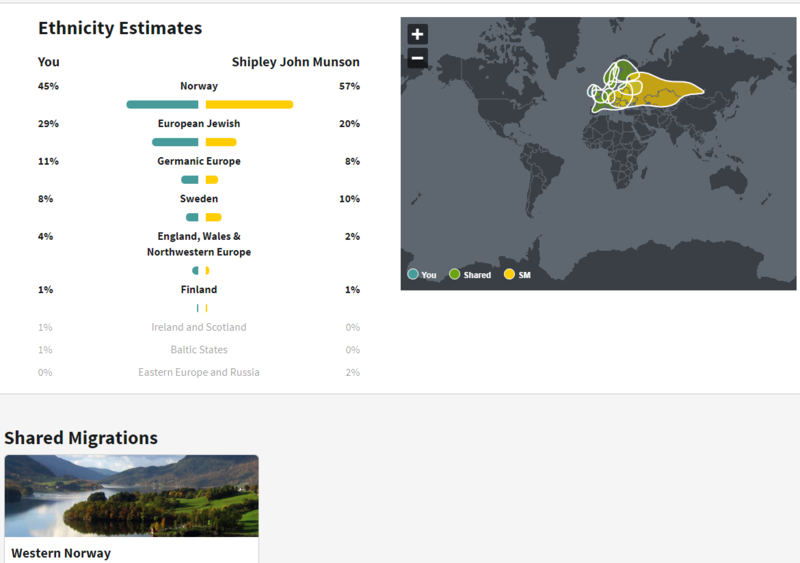 I really like a number of the features that have come out recently at Ancestry . 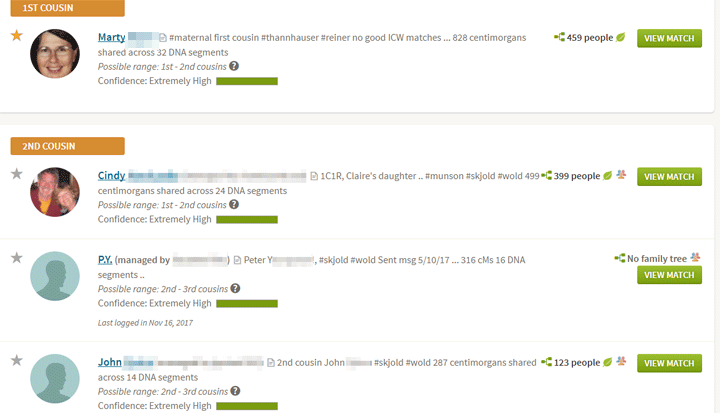 My favorite is that the total amount of DNA shared with each DNA relative is now shown on the match list page in centimorgans (cMs). This means that you no longer have to click through to the match page to find that number. Those total cMs are needed in order to look up the possible relationships at the DNApainter calculator. You want to check there because the cousin designations at Ancestry are just groupings based on the amount of DNA and many relationships share very similar cM numbers. Look at the current top of my 2nd cousin list. These are all children of my first cousins except C.S. who is the grandson of a first cousin. (spot quiz – what is my relationship to each of them? Answer at the end of this article). In each case it shows not only the possible relationship but also the actual cMs and the number of segments. The other recent feature that I truly appreciate is that Ancestry.com indicates whether there is a family tree linked to the DNA, a tree that is not linked, or no tree at all next to the View Match button. In the past there would only be a tree listed when it was linked to the DNA, so you had to go to the match page to see if there was a family tree that was just not connected to the DNA. A word of warning about unlinked trees, they may not be for the tested person. One of my real second cousins did his DNA test through a friend’s account so he is not in their tree at all! Did you notice that little blue compare icon under the green View Match button? 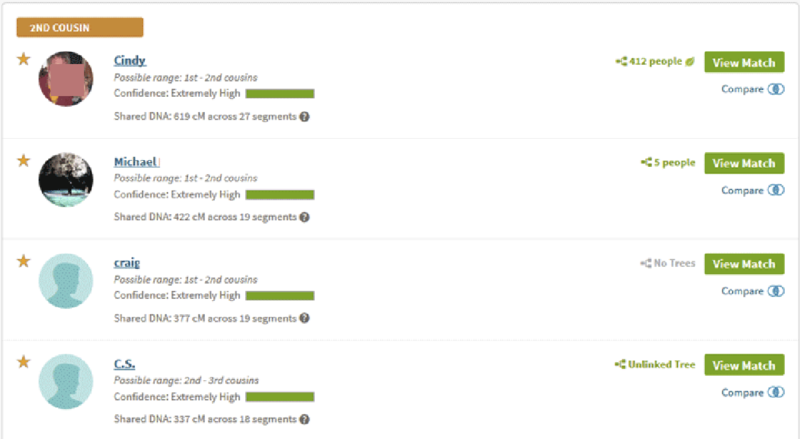 Click on that to get a comparison of the ethnicity of two tests. It always fascinated me to see the amount of difference between two full siblings. Here I am compared with my brother (click it for a larger version). A word of warning. 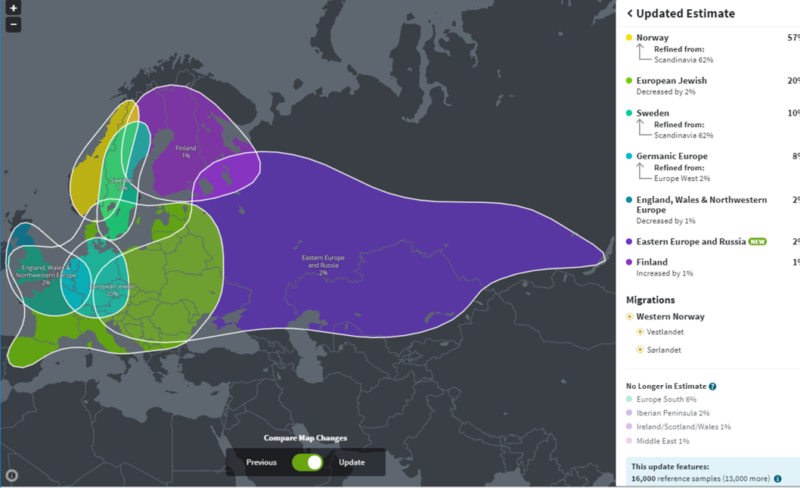 A friend complained that his sister only had a tiny amount of XYZ heritage while he had a good 33%. I pointed out that her ethnicity had not been updated to the new version. Once that was done, she had a bit more XYZ than him! Another benefit of this comparison is the much larger versions of the profile pictures which are on top of the ethnic breakdowns on that page. Space considerations got me to cut them off in my image above. However it is quite nice to get a better idea of what your match looks like than you get from the tiny picture on the match page. Today we all got an email from Ancestry announcing new ethnicity reports for everyone. Adding five times the reference populations plus a better algorithm that can often indicate the modern countries. This time I really do have the new ancestry composition estimates! Naturally I immediately went and looked. Then I messaged and emailed all my tested cousins to accept the new update. 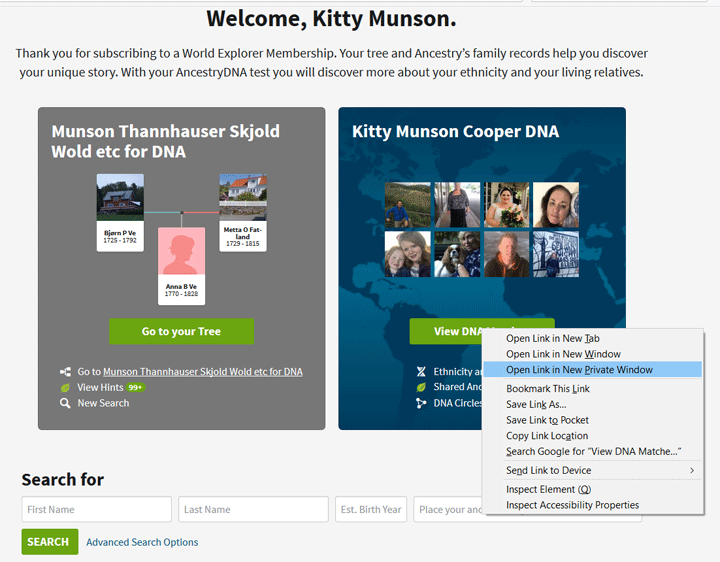 When you log in to Ancestry and click on DNA in the top menu you get a page with three panels. 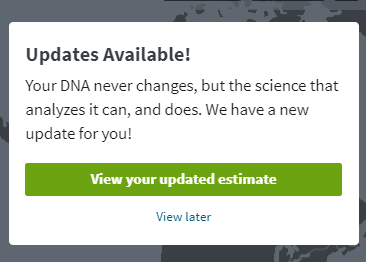 Click on the panel to the left called “DNA story” to go to a page with a world map and the Updates Available box on the upper right. Click the green button that says View your Updated Estimate in that box. Next you have to answer a few questions about your expectations and your thoughts on the previous ethnicity. I am afraid I did not understand that below each was a slider which I could move to indicate the level of accuracy, so until the last one that I answered, I left it alone. I wonder how many others will make that error. The first time on your new ethnicity page, you will see a panel on the right showing how your estimates have changed. Here is mine. I was sad to say goodbye to that unlikely 1% Polynesian! 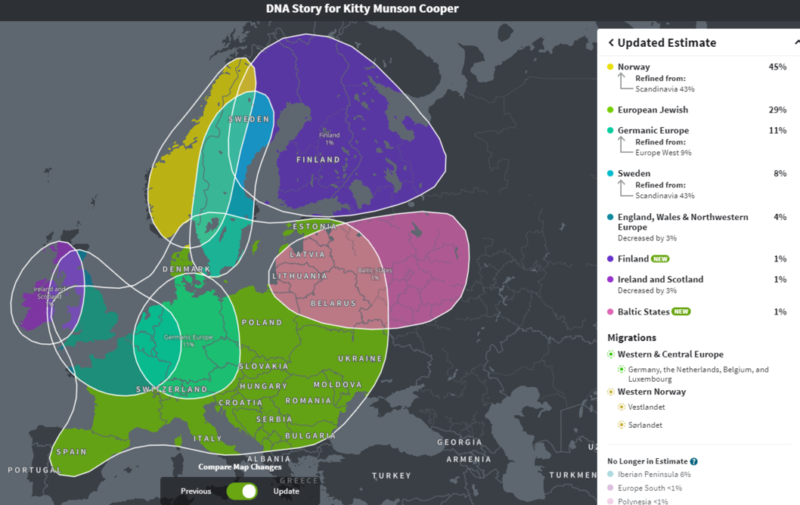 My father was Norwegian American with one fourth grandad (2% of his DNA?) who was German. My mother was born in Munich to a Jewish father and Bavarian Catholic mother. So how does that play out in these new estimates? Could the Swedish be a remnant from the 30 years war where Swedish soldiers rampaged through Bavaria? Actually I think my Norwegian dad had a fifth grandparent who was Swedish but that would hardly show either. By the way you can get back to the page showing the changes together with the new estimates by clicking on the small blue Updates at the top of your ethnicity estimate then the View Previous Estimate at the bottom of the Ethnicity box followed by Compare these results to your most recent AncestryDNA estimate on the next page. Now to look at some more interesting ethnic makeups from my cousins and people I have helped. One thing I have always wanted when looking at my ancestry DNA matches was to list just the unstarred matches or matches that I have identified as being on a specific line. Well there is a new add-on for chrome called MedBetterDNA that will do that for you now, among other great features. Thank you Blaine for mentioning it in your Genetic Genalogy Tips and Techniques Facebook group today. Notice the little multi-colored people icons next to the green leaves? That is from another chrome add on called the AncestryDNA helper and a mouse-over on those icons shows the DNA relatives in common, but that is another blog post not yet written. Most of the time when you send a message to a DNA match at ancestry you get no response. I used to assume that their membership had lapsed or that they had not logged in and seen their messages, but it turns out, that may not be the reason at all. The real reason is that many people are using the Ancestry App on ipads, tablets, or smartphones and the Ancestry App does not show your messages. I was shocked when I finally got this response today from a match. The last date that someone has logged in shows on the match page and I had seen that this person was logging in regularly, but it was from their tablet! So everyone who uses the app please complain to customer service at Ancestry . So how did I get his attention? I left a comment on an ancestor on his tree with a link to the find-a-grave entry! The next day I got the message above. Leaving a comment always generates an email which finally gets their attention.